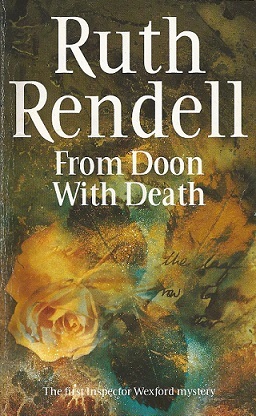 There’s quite a list of authors that I should have read more of – but probably right at the top of that list is Ruth Rendell. And for no better reason than the fact that I found it on my shelf when I was looking for a quick read, it’s time to correct that failing with the first book written by her featuring Chief Inspector Wexford. A very quick read, this one – shorter than some of Dame Agatha’s work, so I’m loathe to talk much about the plot at all. The characters are well drawn, if mostly drawn from the somewhat unpleasant upper classes (in order to contrast with the victim) and most of the book is from Burden’s point of view. If anyone gets the short straw at characterisation, it’s probably Wexford himself, who comes across as a bit of a grumpy stereotype. As for the plot, it’s pretty straightforward. On the one hand, at the time this was written, 1964, I can imagine that readers would have been much more surprised and caught out by the solution, but in this day and age, the surprise is much less shocking. In fact, I found it very guessable. But credit where credit’s due, it was Rendell’s first book and as I said, it was written in 1964, not this year. Hopefully in the later books, Wexford gets a bit more personality, but this is a promising start. Not a series I’m going to race back to, but I’m sure I’ll get back to it sooner or later. I thin you are spot-on that time has not been kind in terms of the main ‘surprise’ about Doon and it is certainly one of her shortest books! If you are looking for some classic Wexfords, I would recommend SHAKE HANDS FOREVER especially, which has a terrific twist, while the very strong A GUILTY THING SURPRISED is an orthodox story that also gives a good pointer towards her later ‘Barbara Vine’ books. I quite enjoyed this book and admired the structure but, as you say, it’s naturally lost something of its impact in fifty years, society having changed as it has. All the Wexfords are solid detective novels at least into the 1980s, when Rendell began losing interest in them. I read this one when I was a teen in the 1970s and I was not only surprised by the ending I was a bit shocked. It was the first mystery novel I had ever read that dealt with a certain topic so openly and compassionately. Rendell as “Barbara Vine” continued to write about these men and women in intriguing and complex ways. I read this as a teenager and I remember being surprised at the ending and enjoying the book very much. I like the early short Rendell books. They are from a time when books were shorter length and you could read one in an afternoon, a mammoth feat these days (and I have no free afternoons any more).